Download "4 NCAC 10F.0101 is proposed for amendment as follows: SUBCHAPTER 10F REVISED WORKERS COMPENSATION MEDICAL FEE SCHEDULE ELECTRONIC BILLING RULES"
1 NCAC F.01 is proposed for amendment as follows: SUBCHAPTER F REVISED WORKERS COMPENSATION MEDICAL FEE SCHEDULE ELECTRONIC BILLING RULES SECTION.00 RULES ADMINISTRATION NCAC F.01 ELECTRONIC MEDICAL BILLING AND PAYMENT REQUIREMENT Carriers and medical providers shall utilize electronic billing and payment in workers compensation claims. Carriers and medical providers shall develop and implement electronic billing and payment processes consistent with CFR 1. Carriers and medical providers shall comply with this Rule on or before January 1, 01. CFR 1 is hereby incorporated by reference and includes subsequent amendments and editions. A copy may be obtained at no charge from the National Archives and Records Administration s website, or upon request, at the offices of the Commission, located in the Dobbs Building, 0 North Salisbury Street, Raleigh, North Carolina, between the hours of :00 a.m. and :00 p.m. History Note: Authority G.S. -(g1); -0; Eff. January 1, 01. 2 NCAC F.0 is proposed for amendment as follows: NCAC F.0 MEDICAL FEE SCHEDULE DEFINITIONS a) The Revised Medical Fee Schedule is being published for the Commission by Medicode, Inc., of Salt Lake City, Utah, and is expected to be available prior to the effective date of January 1, 1. (b) In developing the 1 Revised Medical Fee Schedule (hereafter, the 1 Fee Schedule) the Commission has made the following determinations: (1) The medical fees should be based on the 1 CPT codes adopted by the American Medical Association with values based on a Resource Based Relative Value System (RBRVS). 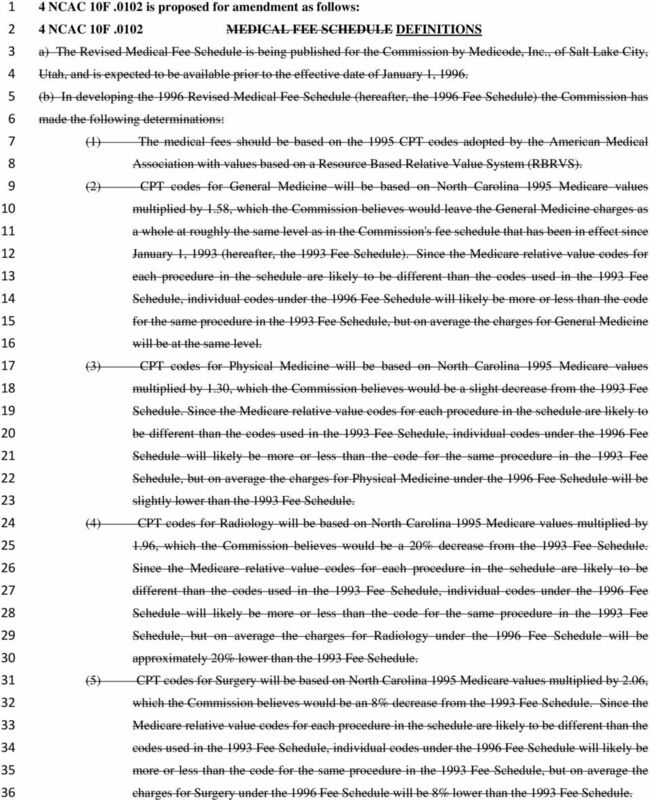 () CPT codes for General Medicine will be based on North Carolina 1 Medicare values multiplied by 1., which the Commission believes would leave the General Medicine charges as a whole at roughly the same level as in the Commission's fee schedule that has been in effect since January 1, 1 (hereafter, the 1 Fee Schedule). Since the Medicare relative value codes for each procedure in the schedule are likely to be different than the codes used in the 1 Fee Schedule, individual codes under the 1 Fee Schedule will likely be more or less than the code for the same procedure in the 1 Fee Schedule, but on average the charges for General Medicine will be at the same level. () CPT codes for Physical Medicine will be based on North Carolina 1 Medicare values multiplied by 1.0, which the Commission believes would be a slight decrease from the 1 Fee Schedule. Since the Medicare relative value codes for each procedure in the schedule are likely to be different than the codes used in the 1 Fee Schedule, individual codes under the 1 Fee Schedule will likely be more or less than the code for the same procedure in the 1 Fee Schedule, but on average the charges for Physical Medicine under the 1 Fee Schedule will be slightly lower than the 1 Fee Schedule. 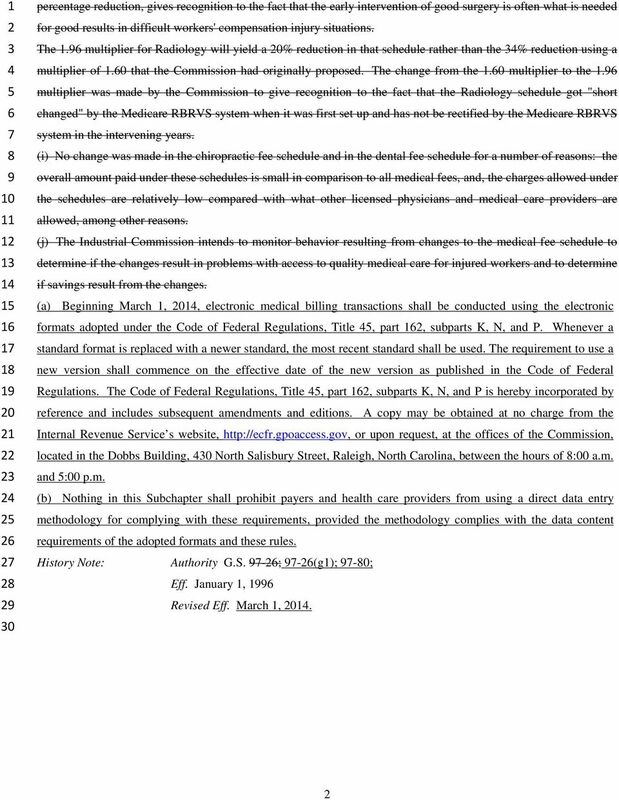 () CPT codes for Radiology will be based on North Carolina 1 Medicare values multiplied by 1., which the Commission believes would be a 0% decrease from the 1 Fee Schedule. Since the Medicare relative value codes for each procedure in the schedule are likely to be different than the codes used in the 1 Fee Schedule, individual codes under the 1 Fee Schedule will likely be more or less than the code for the same procedure in the 1 Fee Schedule, but on average the charges for Radiology under the 1 Fee Schedule will be approximately 0% lower than the 1 Fee Schedule. 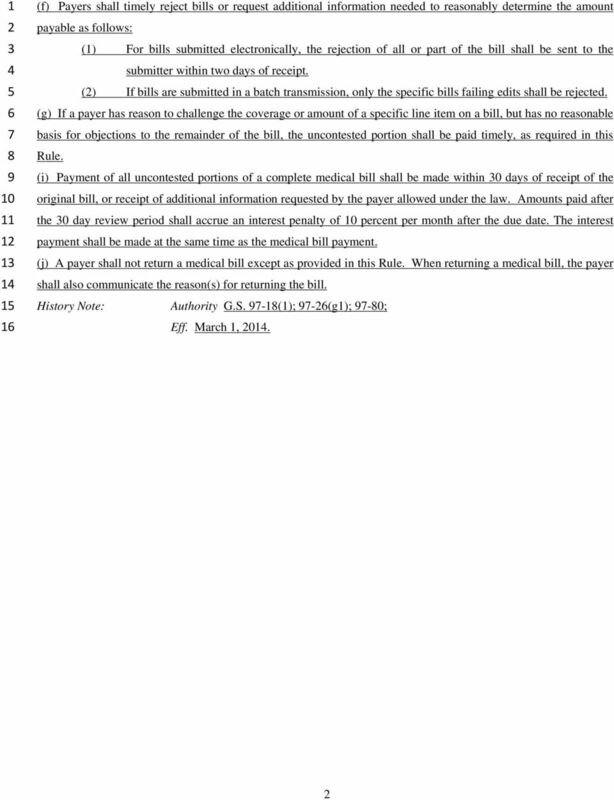 () CPT codes for Surgery will be based on North Carolina 1 Medicare values multiplied by.0, which the Commission believes would be an % decrease from the 1 Fee Schedule. Since the Medicare relative value codes for each procedure in the schedule are likely to be different than the codes used in the 1 Fee Schedule, individual codes under the 1 Fee Schedule will likely be more or less than the code for the same procedure in the 1 Fee Schedule, but on average the charges for Surgery under the 1 Fee Schedule will be % lower than the 1 Fee Schedule. 3 (c) As a whole, the Commission believes that the 1 Fee Schedule will result in at least an % reduction in charges under that schedule. (d) As has been the case in the past, charges under the 1 Fee Schedule are a ceiling and if the provider usually charges a lesser fee for such services, the provider shall charge the lesser fee for cases under the Workers' Compensation Act. (e) Also, upon request the Commission will consider greater charges than that set forth in the 1 Revised Fee Schedule on a case-by-case basis based on the merits of extenuating circumstances proven by the provider. (f) Treatments not covered under the 1 Fee Schedule will be handled on a "by report" basis. (g) The Chiropractic Fee Schedule will stay the same in 1 as it was in 1, as will the Dental Fee Schedule. 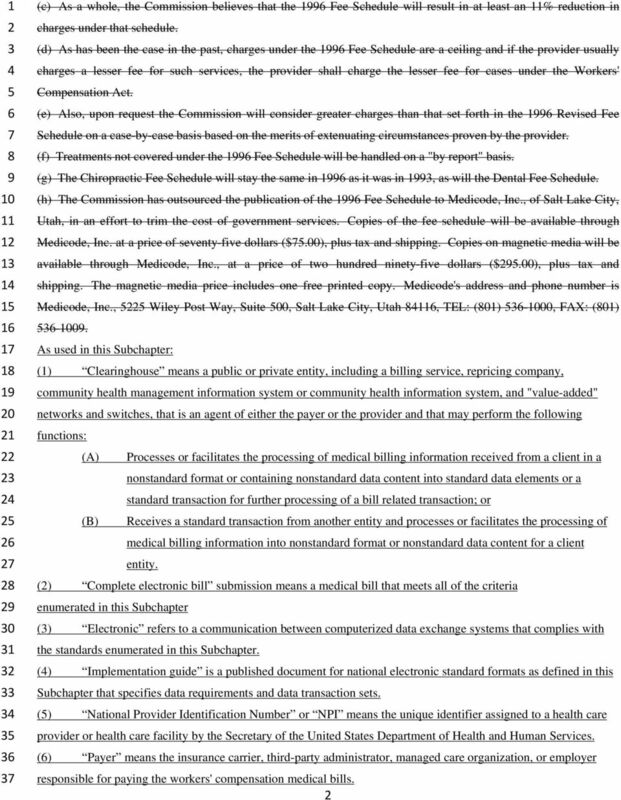 (h) The Commission has outsourced the publication of the 1 Fee Schedule to Medicode, Inc., of Salt Lake City, Utah, in an effort to trim the cost of government services. Copies of the fee schedule will be available through Medicode, Inc. at a price of seventy-five dollars ($.00), plus tax and shipping. Copies on magnetic media will be available through Medicode, Inc., at a price of two hundred ninety-five dollars ($.00), plus tax and shipping. The magnetic media price includes one free printed copy. Medicode's address and phone number is Medicode, Inc., Wiley Post Way, Suite 00, Salt Lake City, Utah, TEL: (01) -00, FAX: (01) -0. As used in this Subchapter: (1) Clearinghouse means a public or private entity, including a billing service, repricing company, community health management information system or community health information system, and "value-added" networks and switches, that is an agent of either the payer or the provider and that may perform the following functions: (A) Processes or facilitates the processing of medical billing information received from a client in a nonstandard format or containing nonstandard data content into standard data elements or a standard transaction for further processing of a bill related transaction; or (B) Receives a standard transaction from another entity and processes or facilitates the processing of medical billing information into nonstandard format or nonstandard data content for a client entity. () Complete electronic bill submission means a medical bill that meets all of the criteria enumerated in this Subchapter () Electronic refers to a communication between computerized data exchange systems that complies with the standards enumerated in this Subchapter. () Implementation guide is a published document for national electronic standard formats as defined in this Subchapter that specifies data requirements and data transaction sets. () National Provider Identification Number or NPI means the unique identifier assigned to a health care provider or health care facility by the Secretary of the United States Department of Health and Human Services. () Payer means the insurance carrier, third-party administrator, managed care organization, or employer responsible for paying the workers' compensation medical bills. 4 () Payer agent here means any person or entity that performs medical bill related processes for the payer responsible for the bill. These processes include reporting to government agencies, electronic transmission, forwarding or receipt of documents, review of reports, adjudication of bill, and final payment. History Note: Authority G.S. -; -(g1); -0; Eff. January 1, 1 Revised Eff. March 1, 01. 6 percentage reduction, gives recognition to the fact that the early intervention of good surgery is often what is needed for good results in difficult workers' compensation injury situations. The 1. multiplier for Radiology will yield a 0% reduction in that schedule rather than the % reduction using a multiplier of 1.0 that the Commission had originally proposed. The change from the 1.0 multiplier to the 1. multiplier was made by the Commission to give recognition to the fact that the Radiology schedule got "short changed" by the Medicare RBRVS system when it was first set up and has not be rectified by the Medicare RBRVS system in the intervening years. (i) No change was made in the chiropractic fee schedule and in the dental fee schedule for a number of reasons: the overall amount paid under these schedules is small in comparison to all medical fees, and, the charges allowed under the schedules are relatively low compared with what other licensed physicians and medical care providers are allowed, among other reasons. (j) The Industrial Commission intends to monitor behavior resulting from changes to the medical fee schedule to determine if the changes result in problems with access to quality medical care for injured workers and to determine if savings result from the changes. (a) Beginning March 1, 01, electronic medical billing transactions shall be conducted using the electronic formats adopted under the Code of Federal Regulations, Title, part 1, subparts K, N, and P. Whenever a standard format is replaced with a newer standard, the most recent standard shall be used. The requirement to use a new version shall commence on the effective date of the new version as published in the Code of Federal Regulations. The Code of Federal Regulations, Title, part 1, subparts K, N, and P is hereby incorporated by reference and includes subsequent amendments and editions. A copy may be obtained at no charge from the Internal Revenue Service s website, or upon request, at the offices of the Commission, located in the Dobbs Building, 0 North Salisbury Street, Raleigh, North Carolina, between the hours of :00 a.m. and :00 p.m. (b) Nothing in this Subchapter shall prohibit payers and health care providers from using a direct data entry methodology for complying with these requirements, provided the methodology complies with the data content requirements of the adopted formats and these rules. History Note: Authority G.S. -; -(g1); -0; Eff. January 1, 1 Revised Eff. March 1, 01. 7 NCAC F.0 is proposed for amendment as follows: NCAC F.0 BILLING CODE SETS Billing codes and modifier systems identified below are valid codes for the specified workers compensation transactions, in addition to any code sets defined by the standards adopted in NCAC F.0: (1) CDT- Codes that refers to the codes and nomenclature prescribed by the American Dental Association. () CPT- Codes that refers to the procedural terminology and codes contained in the Current Procedural Terminology, Fourth Edition, as published by the American Medical Association. () Diagnosis Related Group (DRG) that refers to the inpatient classification scheme used by CMS for hospital inpatient reimbursement. () Healthcare Common Procedure Coding System (HCPCS) that refers to a coding system which describes products, supplies, procedures, and health professional services and which includes CPT- codes, alphanumeric codes, and related modifiers. () ICD--CM Codes that refers to diagnosis and procedure codes in the International Classification of Diseases, Ninth Revision, Clinical Modification published by the United States Department of Health and Human Services. () ICD--CM/PCS that refers to diagnosis and procedure codes in the International Classification of Diseases, Tenth Edition, Clinical Modification/Procedure Coding System. () National Drug Codes (NDC) of the United States Food and Drug Administration. () Revenue Codes that refers to the -digit coding system developed and maintained by the National Uniform Billing Committee for billing inpatient and outpatient hospital services, home health services, and hospice services. 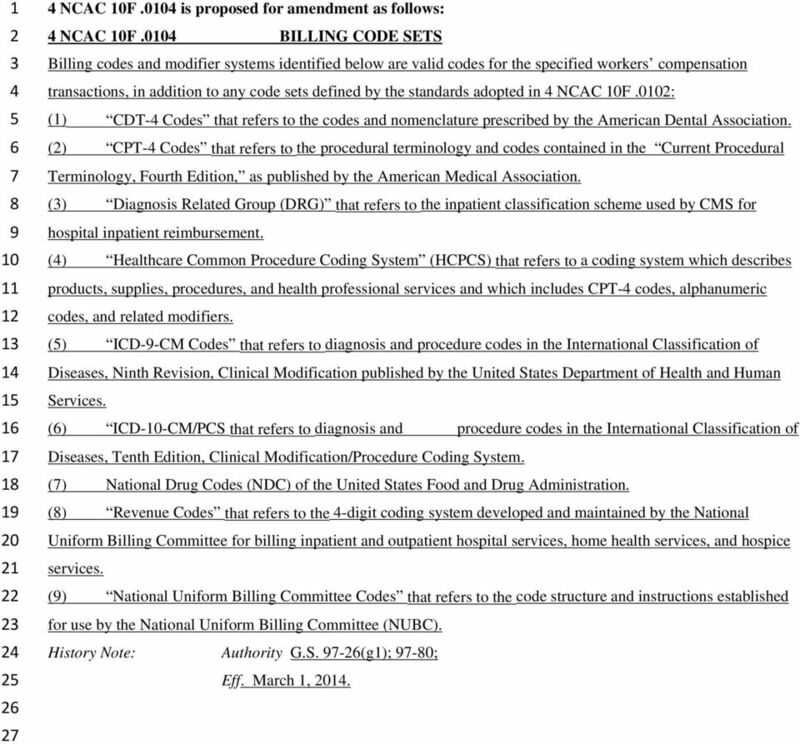 () National Uniform Billing Committee Codes that refers to the code structure and instructions established for use by the National Uniform Billing Committee (NUBC). History Note: Authority G.S. -(g1); -0; Eff. March 1, 01. 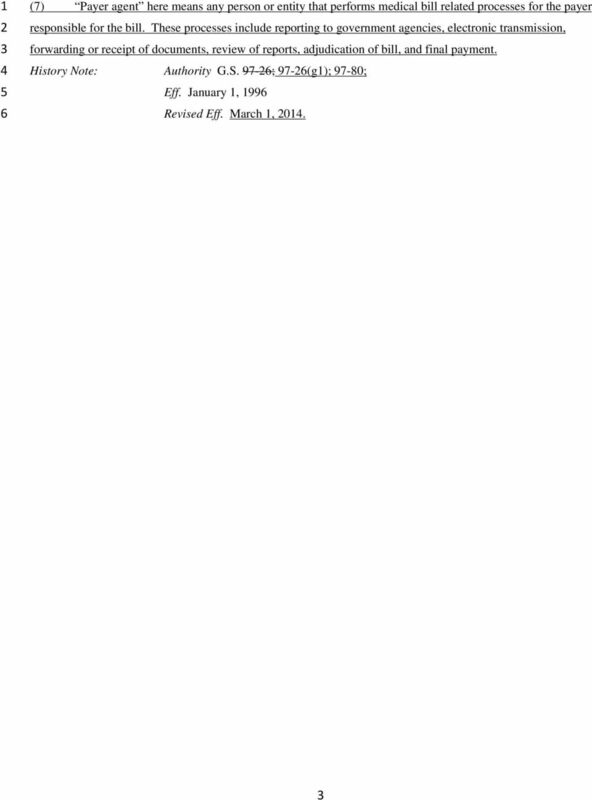 9 (A) accepted as a complete and structurally correct file; or (B) rejected with a valid rejection code. () Health Care Claim Status Response (ASC X1 ) or Acknowledgment transaction (detail acknowledgment) is an electronic notification to the sender of an electronic transaction (individual electronic bill) that the transaction has been received and has been: (A) accepted as a complete, correct submission; or (B) rejected with a valid rejection code. () A payer shall acknowledge receipt of an electronic medical bill by returning an Implementation Acknowledgment (ASC X1 ) within one day of receipt of the electronic submission. 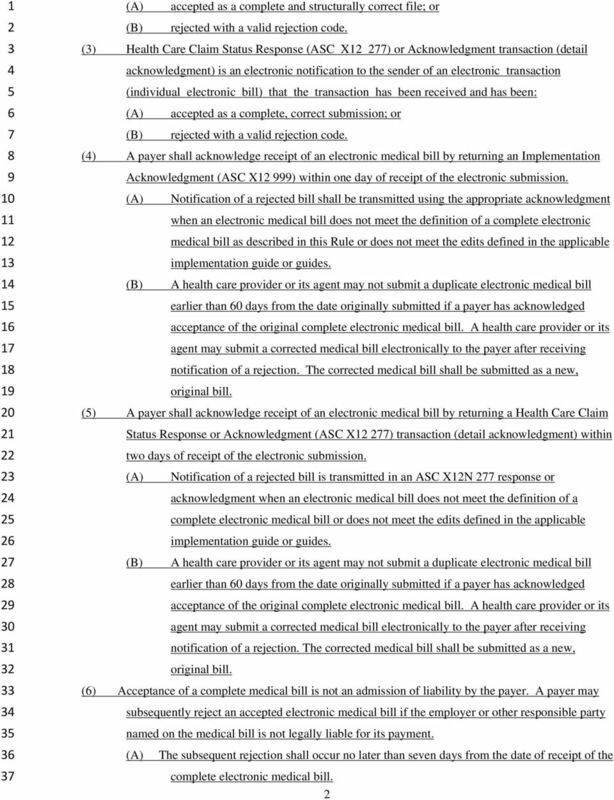 (A) Notification of a rejected bill shall be transmitted using the appropriate acknowledgment when an electronic medical bill does not meet the definition of a complete electronic medical bill as described in this Rule or does not meet the edits defined in the applicable implementation guide or guides. (B) A health care provider or its agent may not submit a duplicate electronic medical bill earlier than 0 days from the date originally submitted if a payer has acknowledged acceptance of the original complete electronic medical bill. A health care provider or its agent may submit a corrected medical bill electronically to the payer after receiving notification of a rejection. The corrected medical bill shall be submitted as a new, original bill. () A payer shall acknowledge receipt of an electronic medical bill by returning a Health Care Claim Status Response or Acknowledgment (ASC X1 ) transaction (detail acknowledgment) within two days of receipt of the electronic submission. (A) Notification of a rejected bill is transmitted in an ASC X1N response or acknowledgment when an electronic medical bill does not meet the definition of a complete electronic medical bill or does not meet the edits defined in the applicable implementation guide or guides. (B) A health care provider or its agent may not submit a duplicate electronic medical bill earlier than 0 days from the date originally submitted if a payer has acknowledged acceptance of the original complete electronic medical bill. A health care provider or its agent may submit a corrected medical bill electronically to the payer after receiving notification of a rejection. The corrected medical bill shall be submitted as a new, original bill. () Acceptance of a complete medical bill is not an admission of liability by the payer. A payer may subsequently reject an accepted electronic medical bill if the employer or other responsible party named on the medical bill is not legally liable for its payment. (A) The subsequent rejection shall occur no later than seven days from the date of receipt of the complete electronic medical bill. 11 (B) the date the bill was rejected by the payer. If a recoupment of funds is being requested, the notification shall contain the proper code described in Subparagraph (e)() of this Rule and a explanation for the amount and basis of the refund. (f) A health care provider or its agent may not submit a duplicate paper medical bill earlier than 0 days from the date originally submitted unless the payer has returned the medical bill as incomplete in accordance with Subchapter. A health care provider or its clearinghouse or agent may submit a corrected paper medical bill to the payer after receiving notification of the return of an incomplete medical bill. The corrected medical bill shall be submitted as a new, original bill. 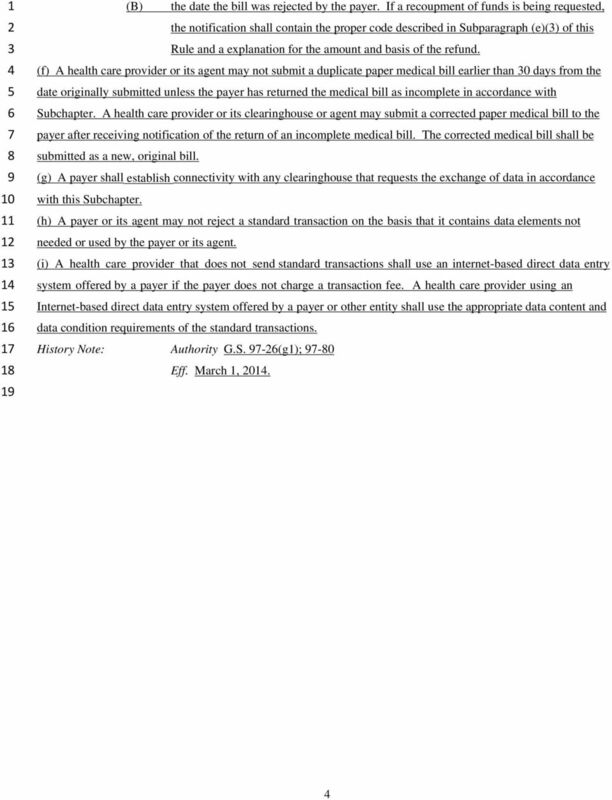 (g) A payer shall establish connectivity with any clearinghouse that requests the exchange of data in accordance with this Subchapter. (h) A payer or its agent may not reject a standard transaction on the basis that it contains data elements not needed or used by the payer or its agent. (i) A health care provider that does not send standard transactions shall use an internet-based direct data entry system offered by a payer if the payer does not charge a transaction fee. A health care provider using an Internet-based direct data entry system offered by a payer or other entity shall use the appropriate data content and data condition requirements of the standard transactions. History Note: Authority G.S. -(g1); -0 Eff. March 1, 01. 12 NCAC F.0 is proposed for amendment as follows: NCAC F.0 EMPLOYER, INSURANCE CARRIER, MANAGED CARE ORGANIZATION, OR AGENTS RECEIPT OF MEDICAL BILLS FROM HEALTH CARE PROVIDERS (a) Upon receipt of medical bills submitted in accordance with these rules, a payer shall evaluate each bill s conformance with the criteria of a complete medical bill as follows: (1) A payer shall not return to the health care provider medical bills that are complete, unless the bill is a duplicate bill. 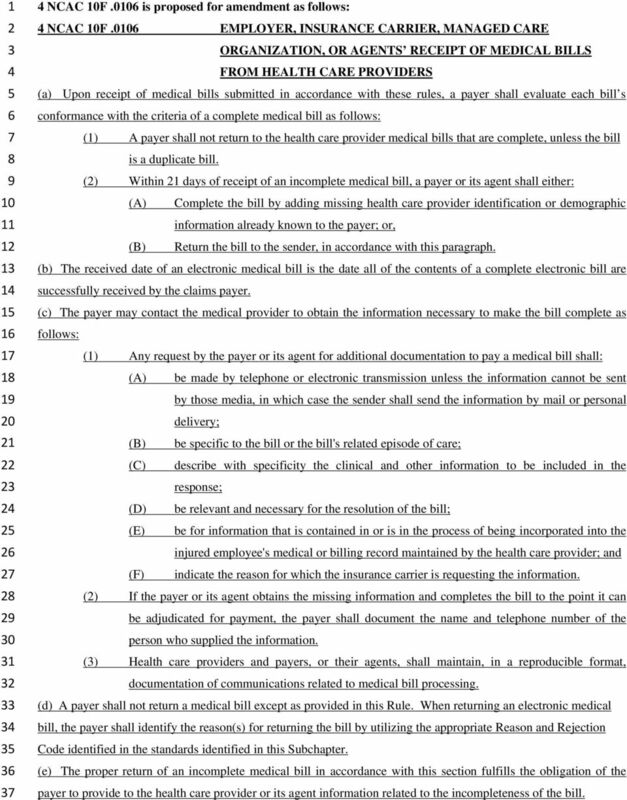 () Within 1 days of receipt of an incomplete medical bill, a payer or its agent shall either: (A) Complete the bill by adding missing health care provider identification or demographic information already known to the payer; or, (B) Return the bill to the sender, in accordance with this paragraph. (b) The received date of an electronic medical bill is the date all of the contents of a complete electronic bill are successfully received by the claims payer. (c) The payer may contact the medical provider to obtain the information necessary to make the bill complete as follows: (1) Any request by the payer or its agent for additional documentation to pay a medical bill shall: (A) be made by telephone or electronic transmission unless the information cannot be sent by those media, in which case the sender shall send the information by mail or personal delivery; (B) be specific to the bill or the bill's related episode of care; (C) describe with specificity the clinical and other information to be included in the response; (D) be relevant and necessary for the resolution of the bill; (E) be for information that is contained in or is in the process of being incorporated into the injured employee's medical or billing record maintained by the health care provider; and (F) indicate the reason for which the insurance carrier is requesting the information. () If the payer or its agent obtains the missing information and completes the bill to the point it can be adjudicated for payment, the payer shall document the name and telephone number of the person who supplied the information. () Health care providers and payers, or their agents, shall maintain, in a reproducible format, documentation of communications related to medical bill processing. (d) A payer shall not return a medical bill except as provided in this Rule. When returning an electronic medical bill, the payer shall identify the reason(s) for returning the bill by utilizing the appropriate Reason and Rejection Code identified in the standards identified in this Subchapter. 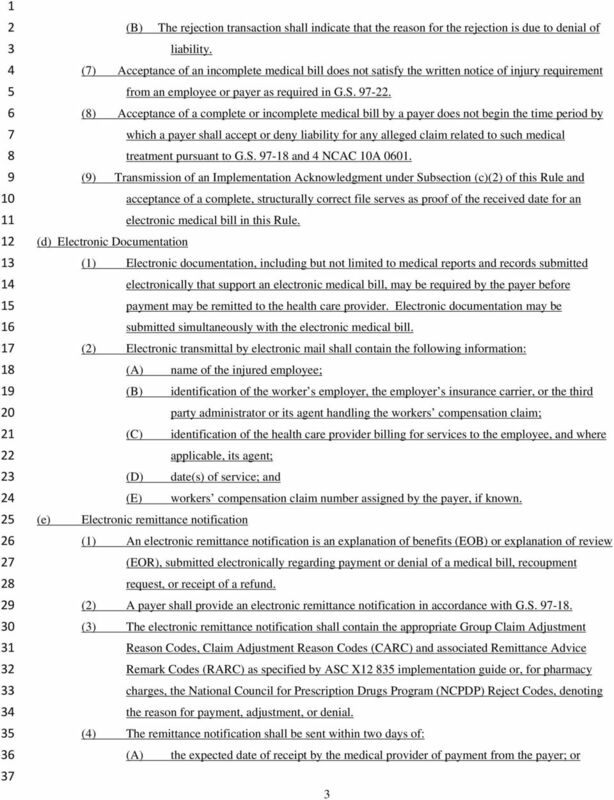 (e) The proper return of an incomplete medical bill in accordance with this section fulfills the obligation of the payer to provide to the health care provider or its agent information related to the incompleteness of the bill. 13 (f) Payers shall timely reject bills or request additional information needed to reasonably determine the amount payable as follows: (1) For bills submitted electronically, the rejection of all or part of the bill shall be sent to the submitter within two days of receipt. () If bills are submitted in a batch transmission, only the specific bills failing edits shall be rejected. (g) If a payer has reason to challenge the coverage or amount of a specific line item on a bill, but has no reasonable basis for objections to the remainder of the bill, the uncontested portion shall be paid timely, as required in this Rule. (i) Payment of all uncontested portions of a complete medical bill shall be made within 0 days of receipt of the original bill, or receipt of additional information requested by the payer allowed under the law. Amounts paid after the 0 day review period shall accrue an interest penalty of percent per month after the due date. The interest payment shall be made at the same time as the medical bill payment. (j) A payer shall not return a medical bill except as provided in this Rule. When returning a medical bill, the payer shall also communicate the reason(s) for returning the bill. History Note: Authority G.S. -1(1); -(g1); -0; Eff. March 1, 01. 14 NCAC F.0 is proposed for amendment as follows: NCAC F.0 COMMUNICATION BETWEEN HEALTH CARE PROVIDERS AND PAYERS (a) Any communication between the health care provider and the payer related to medical bill processing shall be of sufficient specific detail to allow the responder to easily identify the information required to resolve the issue or question related to the medical bill. Generic statements that simply state a conclusion such as "payer improperly reduced the bill" or "health care provider did not document" or other similar phrases with no further description of the factual basis for the sender's position do not satisfy the requirements of this Rule. 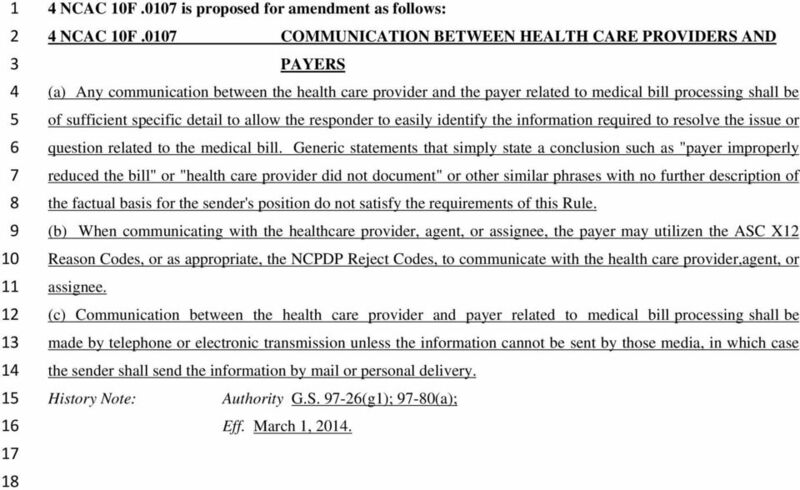 (b) When communicating with the healthcare provider, agent, or assignee, the payer may utilizen the ASC X1 Reason Codes, or as appropriate, the NCPDP Reject Codes, to communicate with the health care provider,agent, or assignee. (c) Communication between the health care provider and payer related to medical bill processing shall be made by telephone or electronic transmission unless the information cannot be sent by those media, in which case the sender shall send the information by mail or personal delivery. History Note: Authority G.S. -(g1); -0(a); Eff. March 1, 01. 15 NCAC F.0 is proposed for amendment as follows: NCAC F.0 SANCTIONS The Commission may, on its own initiative or motion of a party, impose a sanction against a party, or attorney or both when the Commission determines that such party, or attorney, or both failed to comply with the Rules in this Subchapter. The Commission may impose sanctions of the type and in the manner prescribed by Rule of the North Carolina Rules of Civil Procedure. History Note: Authority G.S. 1A-1, Rule ; -(g1); -0; Eff. March 1, 01. 16 NCAC F.0 is proposed for amendment as follows: NCAC F.0 EFFECTIVE DATE This chapter applies to all medical services and products provided on or after March 1, 01. For medical services and products provided prior to March 1, 01, medical billing and processing shall be in accordance with the rules in effect at the time the health care was provided. History Note: Authority G.S. -(g1); -0 Eff. March 1, 01. 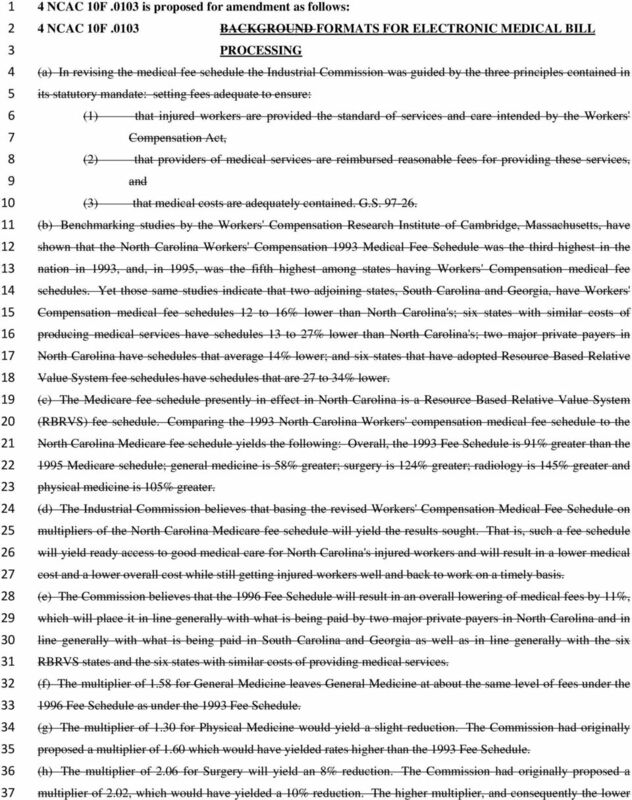 Chapter 82-60 WAC All Payer Claims Database WAC 82-60-010 Purpose (1) Chapter 43.371 RCW establishes the framework for the creation and administration of a statewide all-payer health care claims database. NOTICE OF INTENT Louisiana Workforce Commission Office of Workers' Compensation Electronic Medical Billing and Payment Companion Guide (LAC 40:I:305,306) Notice is hereby given, in accordance with R.S. Georgia State Board of Workers Compensation Electronic Billing and Payment National Companion Guide (Based on ASC X12 005010 and NCPDP D.
(d) Concurrent review means utilization review conducted during an inpatient stay. SUBCHAPTER A. 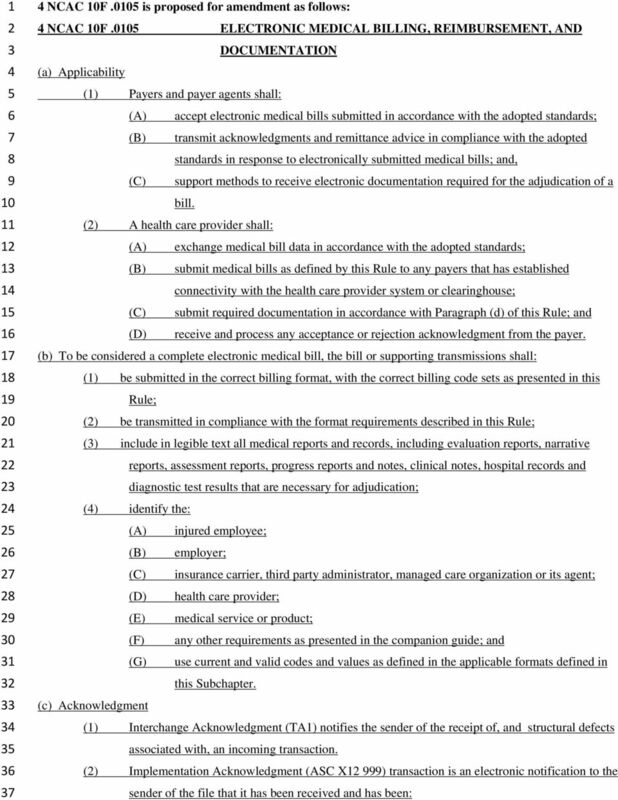 General Rules for Medical Billing and Processing 133.1-133.3. SUBCHAPTER B. 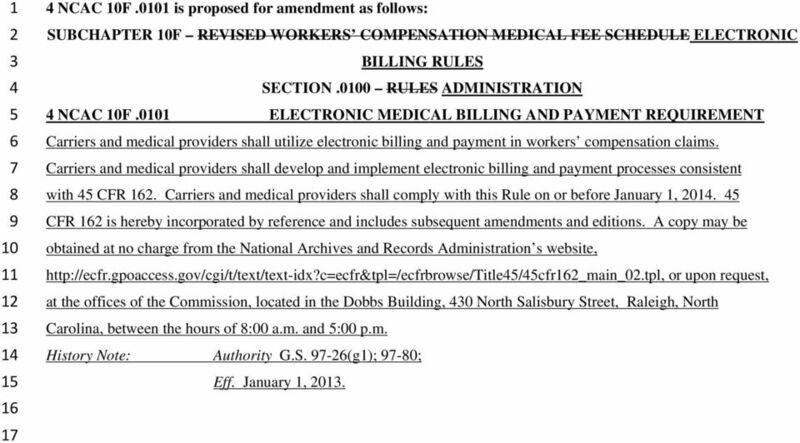 Health Care Provider Billing Procedures 133.10 and 133. STATE OF MARYLAND KIDNEY DISEASE PROGRAM UB-04. Billing Instructions. for. Freestanding Dialysis Facility Services. Revised 9/1/08. FAQs on the Required National Provider Identifier (NPI) Provided by the National Community Pharmacists Association (NCPA) and the National Council for Prescription Drug Programs (NCPDP) At-A-Glance: Important! SECURE EDI ENROLLMENT AGREEMENT INSTRUCTIONS. Select if this is a new application, change of submitter, update. LEGISLATURE OF THE STATE OF IDAHO Sixty-third Legislature First Regular Session - 2015 IN THE HOUSE OF REPRESENTATIVES HOUSE BILL NO.